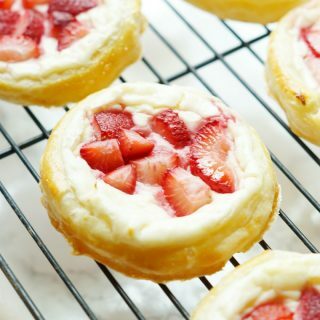 If you are a pastry for breakfast type of person, then you will love this recipe for easy strawberry and cheese danish! Hi everyone! 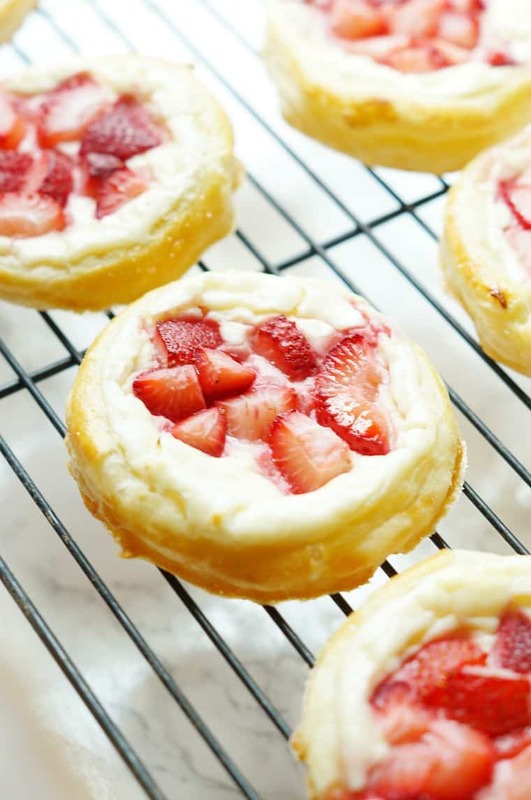 Amanda from Old House to New Home here sharing a recipe for easy strawberry and cheese danish. Guys, I’m not going to lie. I am pretty proud of this one. I brought these easy danishes to a brunch and a few people thought they were store bought! I am definitely not a baker, so I was patting myself on the back as everyone raved about them! The secret to success with the strawberry danish is puff pastry. Seriously, puff pastry always makes a dish look fancier than it is. There is just something about it that adds some flair and fanciness to any recipe. 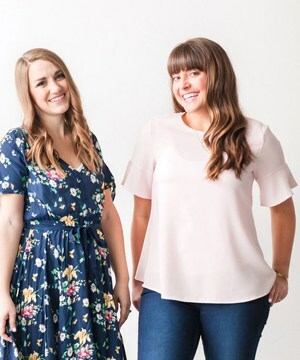 When I made this easy brunch recipe, it took me about an hour from start to finish and was definitely easy. My daughter loved helping me prepare these and it is always fun to get your kids involved in the kitchen! 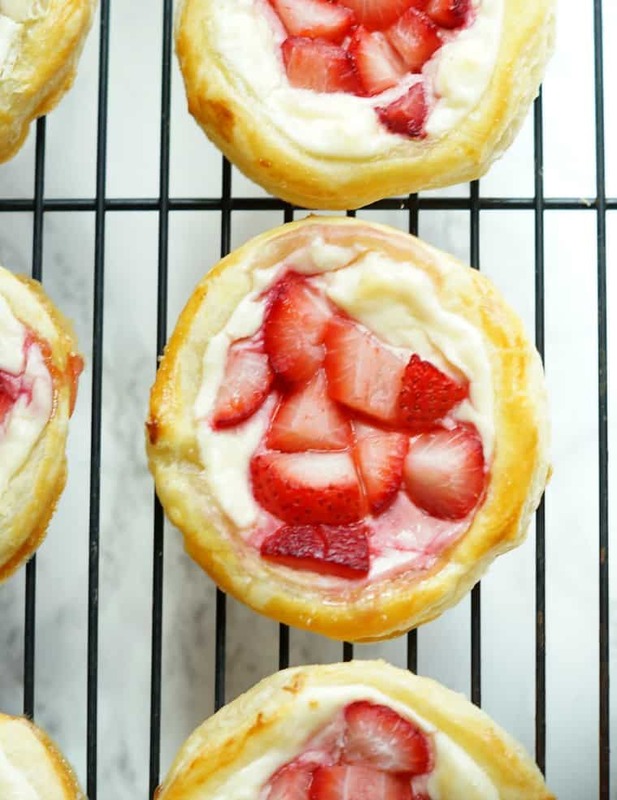 I used cream cheese and strawberries to fill my pastries, but you could definitely sub the fruit for something else. With summer coming, you could definitely add blueberries to make these patriotic looking! When you remove these from the oven, they are big and puffy and beautiful. As they cool, they start to sink, but don’t panic. They look nice that way too and are still light and fluffy with the layers of pastry dough! As with all my baking recipes, I don’t tend to make my baked items overly sweet. I prefer the tang of the cream cheese to shine through, but you can definitely add more sugar to your cream cheese filling if you like a sweeter pastry. If you want to add just a little sweetness at the end, feel free to sprinkle with powdered sugar! 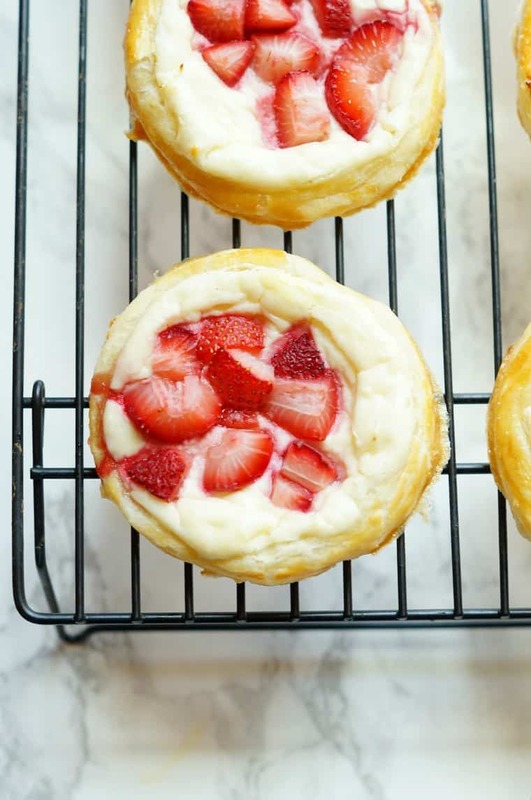 Perfect for breakfast, brunch, or with your afternoon coffee, you will love the simplicity and taste of these easy strawberry and cheese danish! Preheat oven to 400 degrees and line two baking sheets with silpats or parchment paper. Sprinkle strawberries with 1 tbsp. sugar and set aside. In the bowl of a stand mixer, add your cream cheese and beat on medium speed until light and fluffy. Add the powdered sugar, 1/4 cup at a time, mixing well after each addition. Add the lemon yogurt and the vanilla. Beat again for 2 minutes, or until light and fluffy. Set mixture aside. Lay out your sheets of thawed puff pastry on a lightly floured surface. Cut out circles using a 4 inch pastry cutter then lightly press an indentation inside the circle using a 3 3/4 inch cutter. Using a fork, poke holes into the center circle.I used a large cup for the big circle and a wine glass for the second. 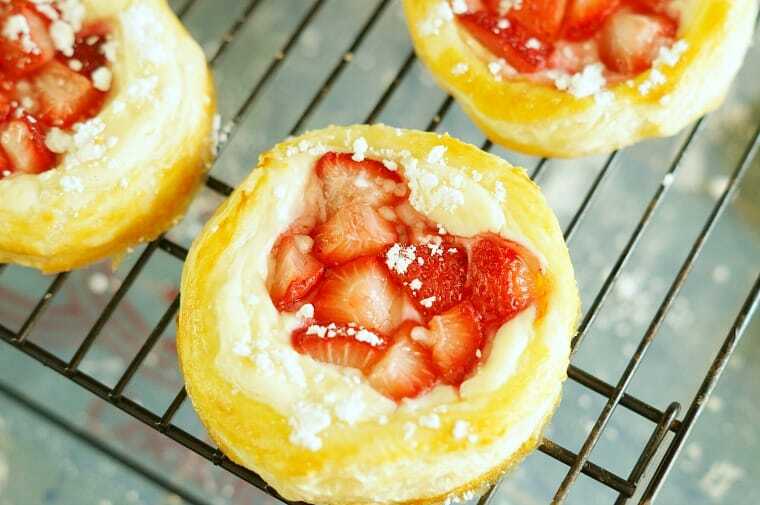 Fill the inner circle with the cream cheese mixture then top each one with strawberries. In a small bowl, whisk together the egg and the water. Brush the mixture onto the outer circle of each pastry. Place filled pastries into the oven and bake for 15-18 minutes or until raised and golden brown. Remove from oven and let cool for 10 minutes, then move to a cooling rack. Once completely cool, sprinkle with powdered sugar if desired. Serve immediately or store in an air tight container for no more than 2 days.